Yes it is to keep the interior warm after you shut the engine off. Everyone is entitled to their opinion of the GLE but as I've posted previously, I've tested the 350 I4 and 450 I6 and both are competent engines that can move the GLE quite well. The !4 is a bit noisy when you press the pedal hard. The I6 is smoother and added HP is obvious. For whatever reason American buyers like/prefer big/loud engines that are often overkill for the size vehicle. My GLS 550 V8 is a good example. It flies when I mash the pedal and sounds great but I rarely drive it hard so a six cylinder engine would work just fine for most driving. I've driven the GLS 450 with a six and it felt pretty good. Much quieter than my V8. But to each his own since you are the one earning those dollars. I test drove a BMW 40i X7 today and the inline six engine moves it very well (very quiet). Many buyers will still opt for the 50i V8 because thats what we do in the USA. BTW, the X7 is very impressive. The next-gen GLS better bring its best game. Does anyone know when the new GLS will come out? 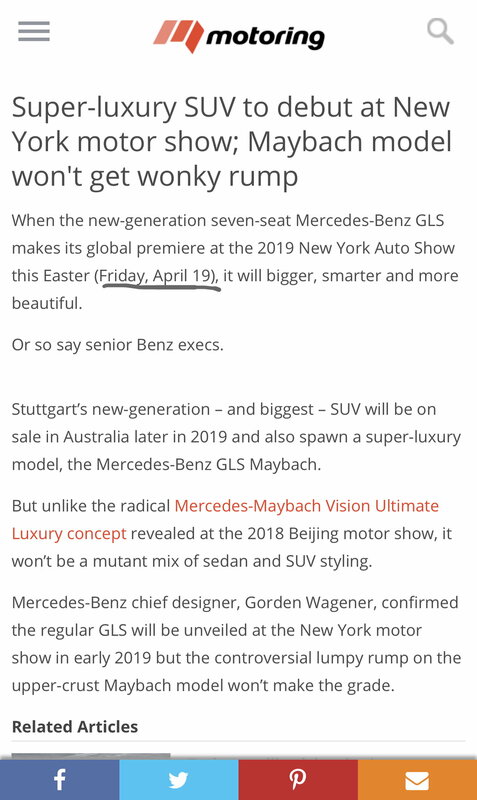 According to Mercedes execs it will be 19th April at New York international auto show! Last edited by Pachole; 03-16-2019 at 10:05 AM. The sales lady I spent 3 hours with yesterday said MB has closed the order banks for the existing 2019 GLS. She said the newly redesigned model should be announced soon with order banks opening up around late summer or early fall with vehicles arriving towards the end of the year. Take it for what it's worth coming from a sales person. Of course, if you want Drivers Assistance Plus, you are required to get the multicontour seats. Truth be told, I probably would not have individually chosen the massage seats, but I sure will enjoy them. I most definitely wanted the Drivers Assistance Plus as I have enjoyed those types of features on other cars (esp. for longer road trips on the highway.) That was a must have. I think I'd like the massage also. Found out today that I can't have the R77 wheels, so will get the RWA. I just still can't see why some of the choices are so limited. What is the hold up with dealers getting these? They have NONE in my area, all they keep saying is that they're on the way lol. Does anyone here have one yet? The dealers should be flooded with these by now. My dealer (Oregon) got their first, a 350, today. Did you test drive the 350 yet? No, it wasn’ t ready. May go out tomorrow. Last edited by GregW / Oregon; 03-17-2019 at 10:59 AM. No, it wasn’ Ready. May go out tomorrow. Haven’t seen it and sales guy is off today. 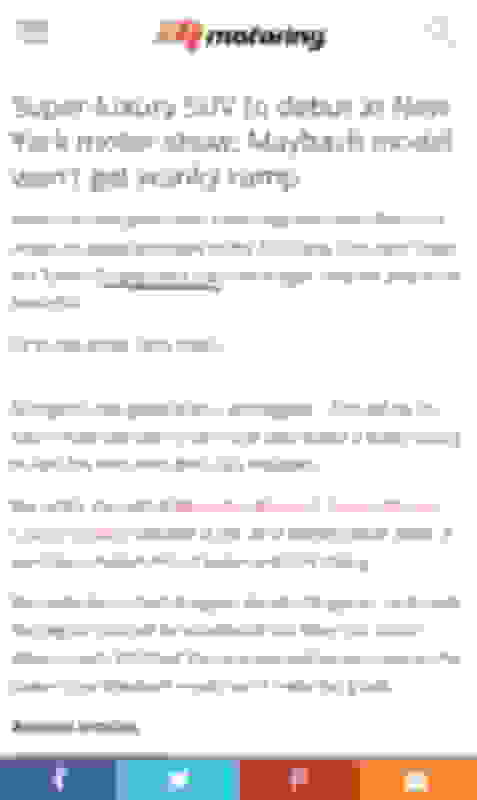 Last edited by GregW / Oregon; 03-17-2019 at 01:47 PM. If you're from DFW, they've had quite a few of them at MB Dallas and MB McKinney, but they may have sold them by now and waiting on more. I drove both the 350 and 450 at McKinney, and I looked at some various colors at MB Dallas. My sales guy at MB McKinney said they were selling them as soon as they were coming in, but I know they've had at least six, and I'm sure more. There were five on the lot at MB Dallas at one time a few weeks ago. I saw them. Another factor is probably shipping, at least to distant locations. They have been building for several months and may now have a bottleneck at the trucker. There is a huge shortage of drivers so truckers may not have the capacity to handle the backlog. Yeah I'm in Frisco, near MB of Plano and they don't have any. Sales are brisk it seems, but production is clearly still ramping up. They have GLCs as far as you can walk lol. Yeah they even had one with 3rd row. The dealer I visited had at least 4-5people waiting in line to check it out. Couldn't see mojave silver..that is why I went there..
Why is it that the MBUSA has $800 Surround view camera option while DOG has $400 Parking assist as an option? The correct amount is $400, MBUSA configurator is incorrect (yet again). If you notice any additional conflicts between MBUSA and the DOG, always go by the DOG. MB Plano used to be my "home store". One of my good buddies was one of the head AMG techs there, but left to start his own shop. I was always treated like a king there for service, but although the sales guys were nice, I wasn't getting the best deals there, so I got in touch with an old contact at MB McKinney and viola. New GLE ordered. Treated very fairly. My old tech is a genius. Awesome dude. Took excellent care of my E63, and then started taking my GLC43 to him for all but warranty. If you need a hook up for him, PM me. I feel he is lot more reasonable, $ wise, than dealer too. Dealer has two in now, white 350 and black 450 (sold). Both fairly vanilla. My 450 had a production date of 3/13, but is still B4 status as of today. I'd rather have it quick and right, but given a choice I'll take right. Still frustrating. 2. Without night package and running boards. i know it is a personal choice at the end of day but based on experience, what do you guys think...? ?